I started this column with the hope that other students would be willing to eat more sustainably sourced and plant-based foods once they saw that “it is so easy a college student can do it.” Here’s to our health and the planet’s! Time for college students to rejoice - the outdoor farmer’s market is back! With a wider selection than the indoor market, students have the chance to buy produce that is fresher, more local, and sometimes even cheaper than Whole Foods. 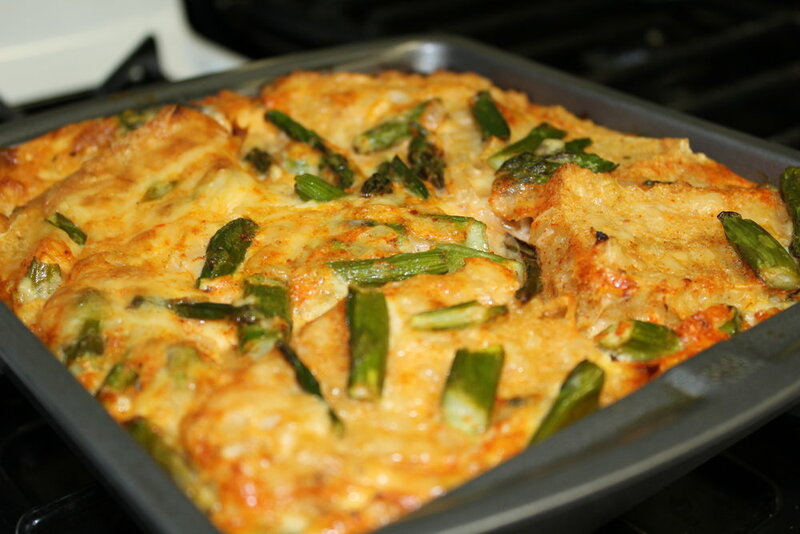 This week I picked up some asparagus and decided to make one of my family’s favorite meals - breakfast casserole. I love making these because you can use virtually any vegetable or cheese (or meat if you really want) and then you have a very filling breakfast, lunch or dinner. As with most recipes, the first thing to do is clean and prep the produce. First, rinse the asparagus and snap off the bottom inch or so of the stalk snapped off (it should break naturally) and discarded. The rest of the stalk should then be broken or cut into bite-sized pieces. Coat a saute pan with a thin layer of olive oil and saute asparagus, onions*, and garlic over medium-low heat for about 5-7 minutes or until beginning to soften - stirring often. While sauteing the veggies, you can layer the bottom of a 8-in square pan with the bread. 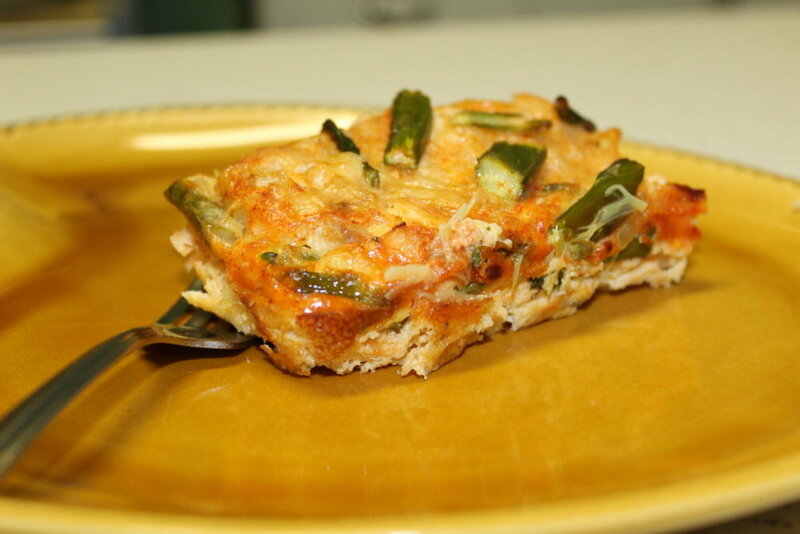 Breakfast casseroles can be made without bread, but we have always done it in my family because it soaks up the egg mixture and allows it to cook much faster. Plus - it’s a good way to use up old bread. In a large bowl, mix together eggs**, milk, cheese, paprika, and seasoned salt. Once it is done sauteing, add in the asparagus mixture. 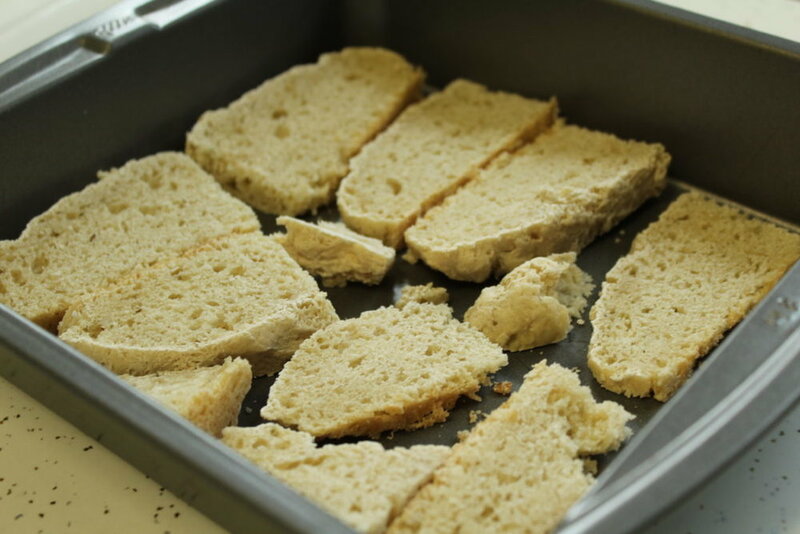 Finally, pour the egg mixture over the bread and bake for 30-40 minutes or until solidified and a knife inserted in the middle comes out mostly clean (it will continue to bake as it stands). Let stand for 5-10 minutes prior to serving then enjoy! *Side Note on Onions: Onions are in season currently, but I doubt the onions I used were grown locally. These onions were left over from a church event and as not wasting food is another important part of green eating, I decided to use them up. **Side Note on Eggs: Eggs are another food item that when bought locally tastes better and has produced less greenhouse gas emissions from travel. Additionally, eggs from local chickens usually have had better treatment. However, eggs are something that I have noticed face the greatest price jump at the farmer’s market ($5-7/dozen). This can be a hard cost to justify for college students or anyone on a lower-income, so I suggest looking for friends or coworkers with backyard chickens that will often sell at much lower prices.